A vibrant and beautiful high rise, Seaglass in Bonita Bay in Bonita Springs Florida is the perfect place to call home. Seaglass, developed by The Ronto Group of Naples, has 26 floors of extravagant luxury and unbelievable amenities. The atypical design of this opulent high rise boasts soaring ceilings, open-air terraces, granite and quartz counters, stainless-steel appliances and kitchen islands. Bathrooms are comprised of dual sinks, marble vanities, soaking tubs and spacious showers. Additionally, residency in the posh tower of Seaglass allows for protected or private parking for up to two vehicles. There are varying floor plans for potential home buyers to choose from, ranging from 3 to 5 bedrooms, 3 to 4.5 bathrooms and 3,500 to 8,000 square feet of living space. Prices also vary in the range of $1 million to around $3 million. Close proximity to Bonita Bay’s fantastic tennis facility, 5 championship golf courses, private boat marina and beach club, also make Seaglass a highly desired place to call home. As a resident in Seaglass you will also enjoy access to the spacious fitness center and full-service spa, club room, billiards room, resort-style swimming pool and accommodations for visiting guests. 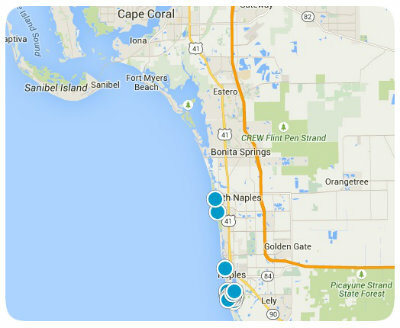 Seaglass also boasts proximity to some of Southwest Florida’s most breathtaking beaches. Barefoot Beach, Sanibel Island and Lover’s Key are a very short drive from Seaglass. Residents can also enjoy the natural beauty of Estero River and Estero Bay, both are great places to escape the hustle and bustle of life and relish the picturesque and tranquil views. Tucked between the City of Naples and the Village of Estero, Seaglass in Bonita Bay is in the immediate vicinity of some of the area’s best shopping and fine dining options. Coconut Point Mall, Miromar Outlets, The Mercato of Naples and Gulf Coast Town Center are all conveniently close and ready to be explored. With easy access to Highway 41, I-75, and Southwest Florida International Airport, you have the freedom to enjoy the amenities offered near or far. As a resident of Seaglass you are sure to enjoy the breath-taking natural beauty of Bonita Bay, as well as the countless amenities, recreational opportunities, attractions and events. If you are interested in purchasing a home in exceptional Seaglass highrise at Bonita Bay, please contact us today for more information.